Survivor of lightning from an untold storm, this venerated elder was standing tall on an early winter’s day. 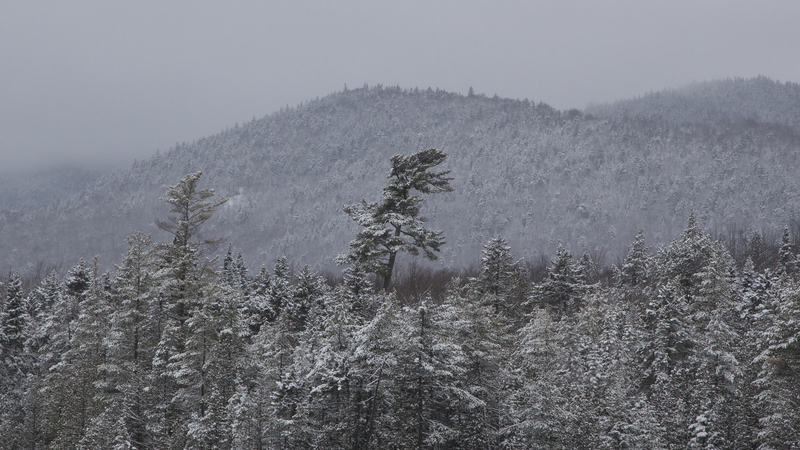 Photographed December 13th, 2014 in the 1675 Grove, Saranac Lakes Wild Forest, Adirondack Mountains, New York. 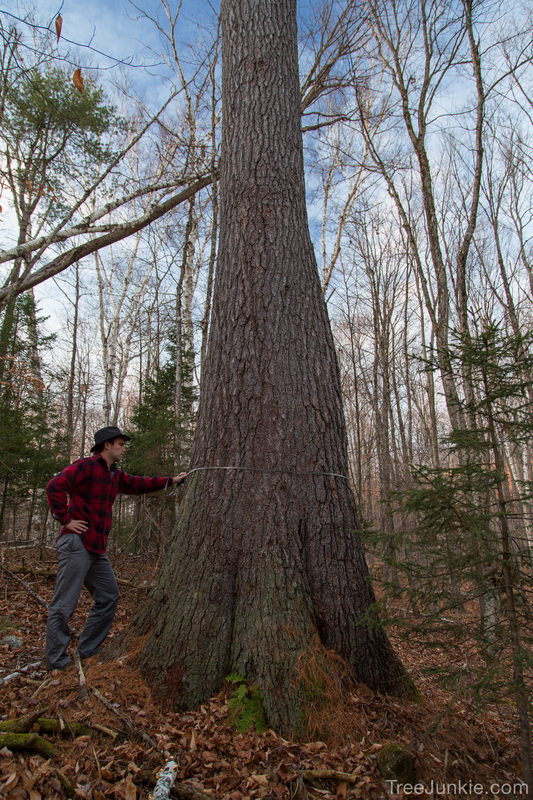 More on this unbelievable eastern white pine in the future . . .
Photographed October 11th, 2014 in the Five Ponds Wilderness, Adirondack Mountains, New York. September 27. Clear, but warmer with a little more haze. Another day of exploration in the Ampersand Woods. I hike to a black cherry growing on a knoll that I’d like to measure. Its diameter is thirty-seven and a half inches. Impressive! Two of its main limbs are broken and hanging by splinters, probably an injury from heavy snow or ice. But otherwise, the tree is doing well. Its bark suggests its older age, some of it flaking off in large sheets. 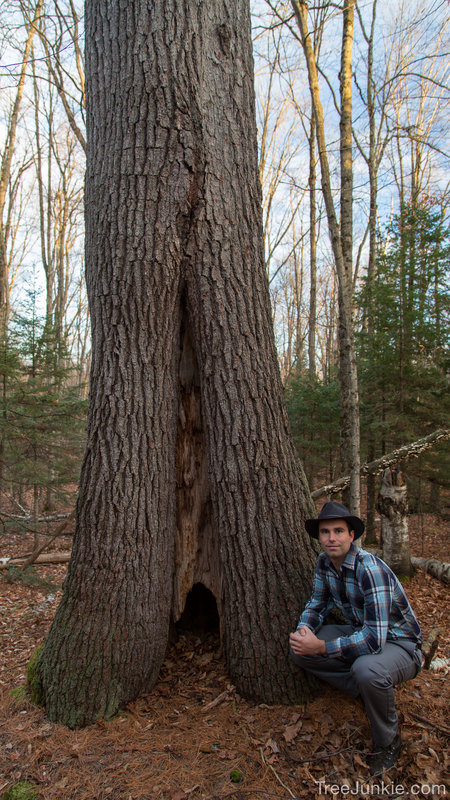 How many black bears over the years have scaled this trunk in pursuit of bitter cherries? I continue on my way towards an old pine stump I found earlier in the season. Its size was memorable and I’d like to measure it. I stretch my tape around the rotten stump and do my best to account for its missing wood and bark. I estimate at four and a half feet (the standard height to measure a tree’s diameter) the trunk was around fifty-six or fifty-seven inches in diameter. 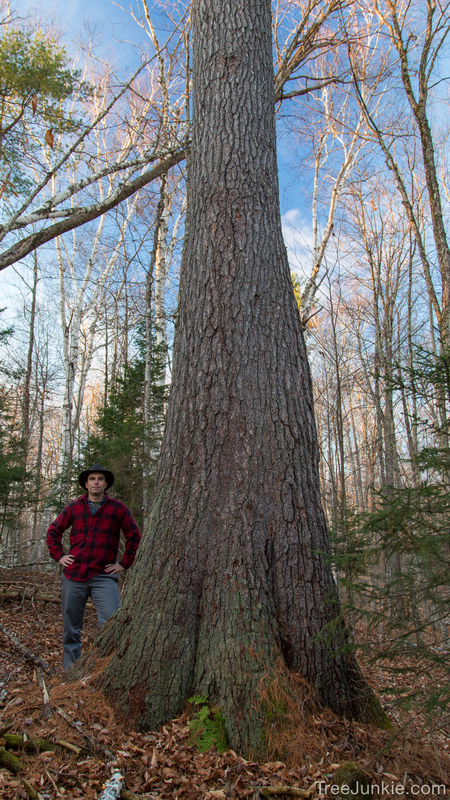 This was a mammoth pine! One hundred years have probably passed since this tree was alive, and based on its size, it could have easily been three hundred years old when it died. As a seedling, this pine would have been growing before any European even set foot in the region. As a mature tree, wolves may have roamed beneath its canopy and passenger pigeons may have perched in its branches. This is The Veteran Pine. I would love to stay and contemplate The Veteran Pine’s history for the rest of the day, but I know there is more waiting to be discovered. I believe this mound is all that’s left of The Veteran Pine’s decomposing trunk. I move on in search of big trees, but instead find myself in a swamp of stunted black spruce. It is a beautiful, solemn old swamp and I will surely be visiting it another day. The sun is getting low and I keep on trekking. The woods open up and I’m greeted by a vast meadow of leatherleaf surrounding an open brook. A glorious Adirondack scene. I take a few pictures and admire the the thin crescent moon brightening in the sky. But the no-see-um welts on my arms, neck, and face tell me it’s time to go. It will be a long bushwhack back through the dark. A GPS, compass, and headlamp are essential. Without them I would be lost, but even with them, I can’t believe how much I want to veer left, always. So many times I convince myself I’m going the wrong way, but I shed my pride knowing my compass is always right. I push through a thicket of red spruce saplings and find a large glacial erratic. On it, a red-backed salamander crawls along its way. The light of my headland reflects off its shiny skin. Another forty-five minutes of tramping and I hear the distant honking of Canada geese. A half hour later I’m back to my car. Time to go home.